AZ Farmstead goat cheese made in small batches by hand. Our goal is to change the way some people think about goat products. I-10 exit 121/Jackrabbit Trail - South on Jackrabbit Trail for 7 miles. Jackrabbit becomes Tuthill Road - Continue south 2 miles to Narramore and turn right (West) - 2 miles to Dean and turn right (North) go .6 miles to the last structures on the left - this is the barn. Mix all ingredients together until they will hold together. 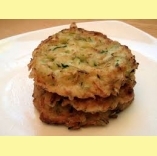 Pat into thin patties, fry in pan coated with non-fat cooking spray.